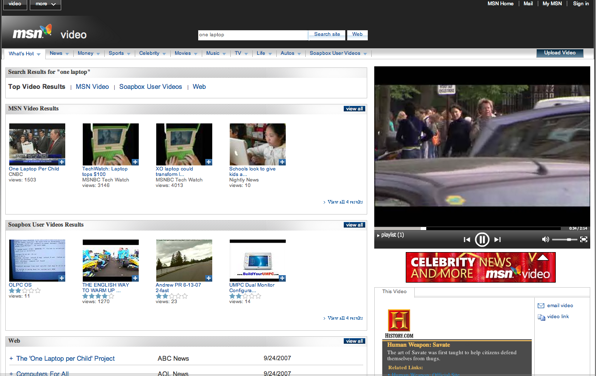 MSN Video just upgraded its video search page. It sports a new user interface that lets you search videos and watch them at the same time on a split screen. Search happens on the left, with search results popping up as thumbnail images. Video consumption happens on the right, in a bigger window. The way people watch video on the Web is evolving fast, and Microsoft is trying to keep up with the times. Video search engine blinkx, for instance, already lets you watch videos in its search results page, as well as create a playlist by dragging and dropping the videos you want to see. Still, it’s nice to see Microsoft follow up on some of these ideas. The notion (borrowed from regular text search) that people want to toggle back and forth between video search and watching the actual videos is going to go away soon enough. Gee, thanks. So that means if you watch videos that are three minutes or longer, you could be shown one ad per clip. How is that an improvement over what viewers on MSN and other ad-supported video sites must endure today? Even on TV, they have the decency not to bombard you that often. I am not sure a time-based approach is the way to go. From a consumer’s point of view, I can tolerate about one 10-second ad per every three or four videos. And if I’m watching a longer video (anything longer than five minutes), the instant the video is interrupted by an ad, I’m probably going to click away. Watching video on a laptop, where you are used to controlling the situation and clicking away to other sites incessantly, puts you in a different mindset than watching on TV. That’s why newer types of ads, such as click-able ad overlays or ad bugs that crawl across the screen, are more promising. Give consumers more control over what types of ads they see and when they seem and, guess what? They may actually watch more ads. The old-TV model of interrupting the viewer experience is something the Web video industry needs to leave behind. (Easier said than done, I know. But someone with the heft of an MSN needs to just do it and show advertisers that there is a better way).